The Sunset Breezehouse sits at the top of a steep hill, affording it beautiful views of Healdsburg’s hills and vineyards. 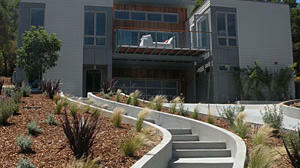 We’ve crossed the finish line and our 2012 Sunset Breezehouse is now complete! If you’re in Healdsburg, the home is open for tours thru September 9th. A video tour of the finished home will go live here in mid-September, the same time you can pick up the October issue of Sunset and see the editorial feature on the home.